Home » »Unlabelled » The Best Job Interview Answer Ever. This Man Just Nailed It!! We are faced with dilemmas every day in our life and it is our discernment in the crunch time that defines who we are and how far we will go. When it comes to wisdom, thinking ‘out of the box’ is what sets us apart from the hordes of people. These “others” just reflect what they have heard and are of the opinion that it is the right solution to the problem. Talking about thinking out of the box, this guy just used his humor and common sense to nail a job interview by doing the same. 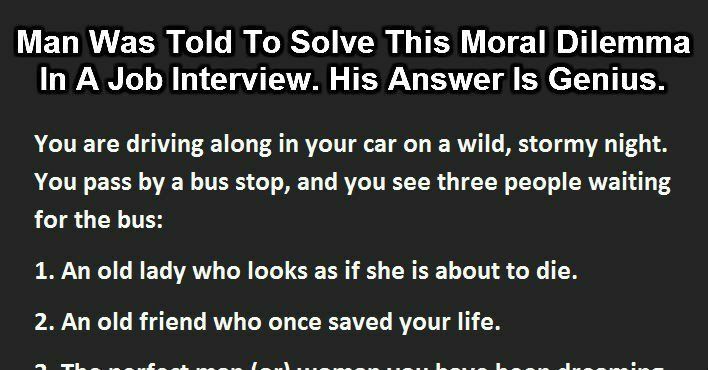 While most us during job interviews are formal and restrict ourselves to look the part or adhere to the tone of society, this guy used his wits to solve the dilemma they questioned him with. The company handed out 200 applicants a test paper with just this question, and among them, this guy was the only one who got selected for the job. This is why! !